Living with an Australian host family in Cairns is a terrific way to experience all that Australia has to offer. Many international students choose to live with a Homestay host family while studying Cairns. Here is everything you need to know about Homestay in Australia. As an international student, Homestay offers a safe, caring and supportive home environment with a host family while you are immersed in your studies. You will enjoy being part of an Australian family, living like a local while being invited into the Cairns community. You will likely develop lasting friendships with your Homestay host family, their friends and your fellow international students. Cairns is a friendly multicultural student-friendly city that welcomes international students to its world-class educational institutions. Located in the heart of one of Australia’s most popular tourism regions, north Queensland is home to two World Heritage icons, the Great Barrier Reef and the Wet Tropics Daintree Rainforest. The Cairns Student Hub is located in the Cairns CBD and is a valuable meeting place for international students. Regular social and educational events are held at various locations around Cairns and offers a great opportunity to meet fellow students. Visit the Hub to meet, chat or find out who to talk to if you have questions that your host family or educational institution cannot answer. Make sure you Like the Student Hub Facebook page to keep up to date with student news and activities around Cairns. This Study Cairns video is also available with Spanish, German and Chinese sub-titles. Many host families live and work within the local community and are selected as hosts for their friendliness, availability and the care and respect they have for international students. Host families welcome students into their homes as though they are part of the family. Students being hosted by a family should respect Homestay hosts and treat the home with care, participating in daily household chores just as other family members do. While you are studying and living in Cairns you will see and experience lots of amazing new things, many that will be unfamiliar. Learning about Cairns, Queensland and Australia is all part of the experience of being an international student. Your Homestay family will probably be as curious about your own culture and customs as you are about Australia. Try to share your culture with your host family while being open to learning about Australian customs. 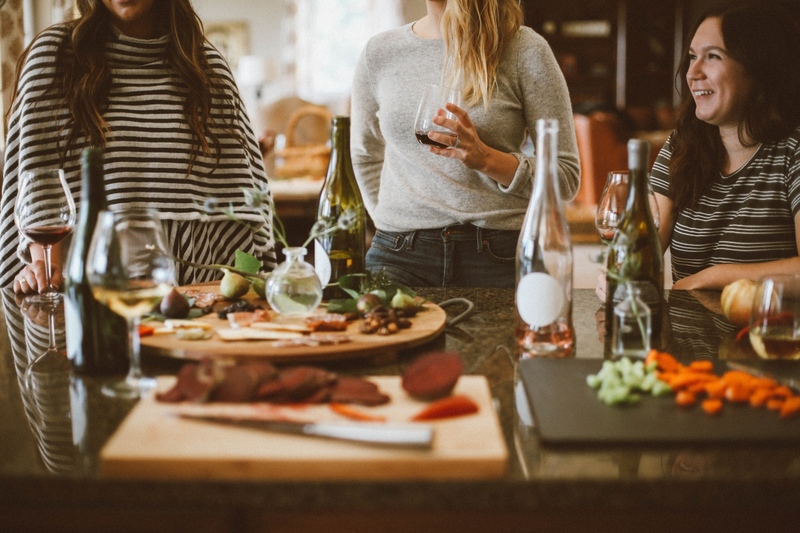 The evening meal is a good time to share stories about food from your home country – why not arrange to cook your favourite meal sometimes as a way of introducing your host family to cuisine from your country. Australian families are all different and come from wide and varied backgrounds. Cairns is a multicultural city and is home to people from many ethnic backgrounds. Australians can choose to practice any faith and there are many different religions, for example, Christianity, Buddhism, Islam, Hinduism and Judaism. The size and structure of an Australian family varies. There may be families of two parents with children, couples with no children, one parent families, and families with elderly parents or other adults living with them. There are also ‘blended’ families, meaning that the parents have children living with them from previous marriages or relationships. Many Australian families have a household pet, with cats and dogs being the most common but families may also keep birds, tropical fish and rabbits as pets. Pets live inside or outside the home depending on the family’s preference. Domestic pets are house-trained but are not allowed inside most public places and are kept on a leash when at public beaches or parks. It is not unusual for a pet dog to travel unrestrained in the car with the family. 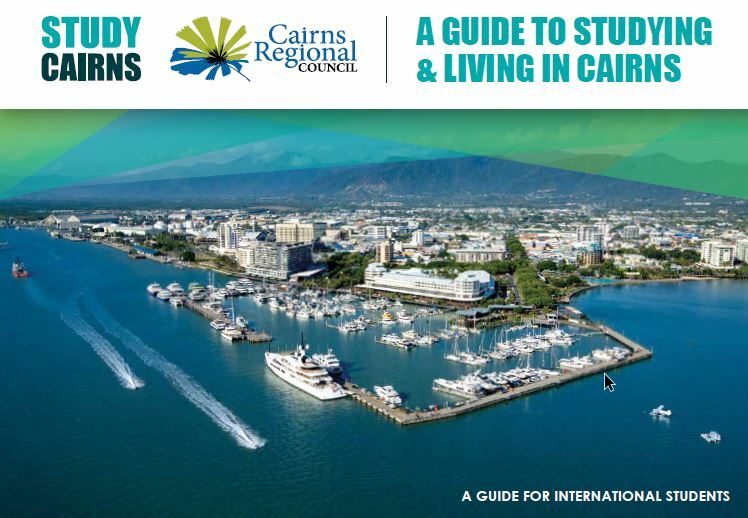 Study Cairns has created a useful Guide to Studying & Living in Cairns – download it today! Most Australian families do not have household help. Often, both parents work so it is usual for every member of the family to help with household tasks. You may be asked to help in the kitchen, to clean your bedroom, take the dog for a walk, feed the pets or do small tasks in the garden. Many families in Cairns live in a house with a garden, often with a swimming pool. It is common for houses to have three or four bedrooms, one or two bathrooms, a separate kitchen, living room and laundry. A media or TV room is usually the main living room where the family gathers to socialise and watch movies or television. Outdoor patios or decks are used for dining and socialising. Houses are made from timber or brick and vary in style, size and age. Some classic Australian homes are known as Queenslanders, which are made from timber and are elevated on stilts to allow breezes to naturally cool the upper level of the home. Modern homes have air-conditioning and ceiling fans. Australians usually soap up and wash inside a shower cubicle so water does not splash on the bathroom floor. The bath, shower and toilet are often in the same room. There may also be a bathtub. Water is a precious commodity in Australia and conservative use of water is encouraged. As a guide, a shower should take a maximum of 4 minutes, and you should half fill the bathtub if you take a bath. Toilets are western, pedestal style and toilet paper (not water) is used. Males should lift the seat to urinate. Feminine hygiene products should be wrapped and placed in an appropriate rubbish bin. Australian families usually eat and drink in the kitchen, dining or lounge room of the home. In Cairns tropical climate it is usual to eat and cook (on a gas BBQ) outdoors. Males, females and children help to prepare food, set and clear the table, wash and wipe dishes and put food items away when the meal is finished. If there is a dishwasher, it’s polite to load dirty dishes in the dishwasher and unload the dishwasher when the wash cycle is finished. The food eaten by Australian families and the customs associated with eating can depend on the family’s cultural background. Most families eat a wide variety of food influenced by different cultures and cooking styles. North Queensland benefits from a ready supply of fresh fruits, vegetables, dairy products, seafood and meat. Food is purchased from supermarkets (open 7 days a week), farmers markets or at fresh produce markets like Rusty’s Market in the Cairns CBD. Eating out is popular, as is purchasing pre-cooked take away meals which can be eaten at home or in a public park like the Esplanade or at the beach. Cairns has many landscaped shady parks and it’s not uncommon to have a picnic lunch in a park, where groups of friends or families congregate socially over a casual meal or BBQ. Everyone brings something to eat and food is shared amongst the group. Meals are usually eaten with a knife and fork although some Australians will use chopsticks when eating Asian meals. In Australian culture, it is not polite to make noises such as slurping or burping while you are eating, and it is considered rude to speak with your mouth full. Most families do not eat their morning meal (breakfast) together. It is usual for family members to make their own breakfast, for example, cereal, toast, fruit, yoghurt or eggs, with tea, coffee or fruit juice. On weekends people may meet in a café for breakfast or brunch, which is mid-morning and is considered a late breakfast or early lunch. The evening meal (dinner) is usually a hot meal and often the largest meal of the day. A typical Australian dinner consists of meat, vegetables, rice or pasta. Dessert (known as sweets) may be served as a sweet treat after dinner. Many families sit down to eat and talk over dinner and evening meal time is often a social time where everyone will interact with each other. This is a perfect time to practice your spoken English by sharing anecdotes from your day or asking questions about things you may not understand. Your Homestay family will invariably be kind and understanding people who will want your experience in Cairns to be rewarding and positive. However it is normal to feel nervous or shy when meeting your host family, especially if English is not your first language. Australian accents can be difficult to follow and may sound different to other English speakers you may know. Australians also have a form of good-natured banter known as Aussie slang, which may take some time to understand. If you don’t understand something, it is a good idea to ask them to explain. You will begin to feel more comfortable with your host family if you talk to your family and share any concerns you may have. Most Homestay families will have a home-based wifi system that each family member uses. Some homes may have limited internet plans which limit the amount of data uploads and downloads so it’s important to find out if there are any ‘house rules’ about internet usage. For example, there may be times when you are unable to access study resources, download movies or play online games. Optus and Telstra are the main mobile phone service providers with city-wide mobile and data network coverage in Cairns. Purchase a pre-paid sim online or at their retail stores. You must abide by the safety instructions you are given for inside and outside of your Homestay. This includes travel safety, rules about pools, play equipment, bush and beach safety, personal security and internet safety. Cairns has a public bus service which connects most suburbs with the city. Public transport runs seven days a week but there are limited services on weekends and public holidays. The city has a large network of cycle and walking paths – getting around by bike is a safe, convenient and free form of transport. All cyclists must wear a helmet. Study Cairns can help you find the international education experience you are looking for in Cairns. 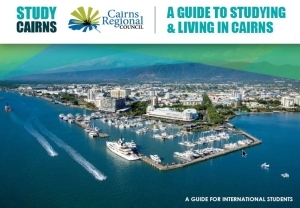 Study Cairns is an education, training and tourism network representing organisations, institutions and businesses in Cairns that are dedicated to providing help and support to students in the Cairns region. Cairns is home to a broad range of world-class education programs, from study tours, English language courses, primary and secondary schools, Universities and vocational training. The Cairns Student Hub is managed by Study Cairns as a supportive environment that aims to enhance the international student experience in Cairns. The Cairns Student Hub is co-funded with the support of the Queensland Government’s International Education and Training Partnership Fund, managed by Study Queensland within Trade and Investment Queensland. The Cairns Student Hub is also proudly supported by Cairns Regional Council, educational institutions and local business, and forms the centrepiece of a thriving multi-cultural student community. Located in the heart of Cairns city, the Student Hub provides a welcoming space for students to utilise as a space to connect with fellow students, colleagues and the wider student community.